Poet, playwright, and a founding editor of IKON magazine, SUSAN SHERMAN has published seven collections of poetry. She has had twelve plays produced off-off Broadway. Her translation of Shango de Ima (Doubleday) won eleven AUDELCO awards for the Nuyorican Poets Cafe production. Her critically acclaimed memoir, America’s Child: A Woman’s Journey through the Radical Sixties (Curbstone) was published in 2007 and her book of selected poems, The Light that Puts an End to Dreams (Wings Press, 2012) with an introduction by Margaret Randall and photographs by Joséphine Sacabo, is a mixture of intense political poetry, intimate love poems and provocative reflections. Her latest Book, NIRVANA ON NINTH STREET (Wings Press, 2014) “a sunning evocation of the countercultural life of the East Village” is a collection of inter-related stories that take place in the East Village/Lower East Side in and around the 1960s. Among her many awards are a NYFA fellowship for creative nonfiction, a NYFA Fellowship in poetry and a Puffin Foundation Grant. A brilliant performance… Sherman has evoked the untamed spirit of the Lower East Side and of the dreamers who live there. They love, make art, and protest as the Vietnam War rages and the sexual revolution takes root. Nirvana On 9th Street is pure magic, a gripping exploration of the mysteries of the human heart. 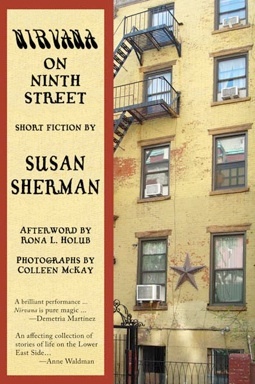 Meet a cast of humble, endearingly human and engaging characters in Susan Sherman’s Nirvana On Ninth Street, an affecting collection of stories of life on the Lower East Side in the 60s and just a bit beyond. It’s a short slice of creative time, through the eyes of this author who knew it well. Relationships, pets, political agonies, escape artists, woodworkers, poets all co-exist. The identities and complications of people in a neighborhood of flux and change are emotionally present and very much alive. Nirvana’s characters weave around each other, their singular histories intertwined in the fabric of the street they share. The Lower East Side lives, breathes, grows into the East Village, Sherman’s sympathy never wavering, and Colleen McKay’s photos and Rona Holub’s “Afterword” emphasizing that these fictions have a real home. A unique, charming book. A very readable book that brings back many memories.